1. Would this shape still be blue if it were red? 2. Would this shape still be blue if it had four sides? But that is because mathematicians like to try to look for symmetry and otherwise try to generalize things. 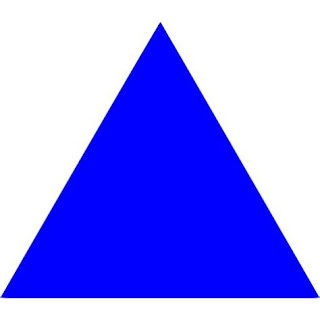 Would it be proper then to say that you, as the blue triangle's creator, can say which qualities are necessary? In this case, you focus on the triangle-ness of it, rather than the color, but could just as easily have focused on the color rather than the shape. Or is it that all the qualities are of it are contingent? And then this leads to the general question: what qualities of the rest of things are necessary vs contingent? To personalize: are any of the qualities of D.J. Schreffler necessary, or are they contingent? But while that's unsettling, that's not getting any information about God, and so is not theology by any stretch of the imagination. I admit to looking forward with heightened anticipation to more on theology. "Would it be proper then to say that you, as the blue triangle's creator, can say which qualities are necessary?" Perform the experiment. For each quality ask, "Could this be otherwise?" If the answer is no, it's a necessary quality. The triangle's creator only gets to determine its contingent qualities. They are contingent on an external being, viz. me. "In this case, you focus on the triangle-ness of it..."
Careful. You're wandering into nominalism. The triangle doesn't have a quality called "triangleness". It IS a triangle--the thing in which the qualities subsist. But that's a question of essence vs. accidents. Everything that's not God is contingent being, but all contingent beings have necessary and contingent properties. Again, use the handy test above to sort them out. Glad you're looking forward to more. I understand my confusion now. The triangle doesn't have a quality called "triangleness". It IS a triangle--the thing in which the qualities subsist. But that's a question of essence vs. accidents. Exactly correct. My mistake is attempted generalization: triangle as accident with polygon as the essence. OTOH, generalization is one of the two main goals of math (where my training and degrees are), with the other one being specification. And thus 'blue triangle' is an instance of the more general 'colored polygon'. I reject nominalism. I certainly believe that universals exist. At least I think I do, but there is often a gap between what one thinks that they believe, and how they act, hence rampant hypocrisy in society. Confusion cleared up, well and good. Oh gosh. The shape *does* have the property of triangleness (and in the literal example, approximate triangleness as in we can treat it as a triangle without being horribly wrong in most circumstances). It is necessary that *IF* it is a triangle then it has three sides but it is not necessary that it be a triangle. To apply that to Brian's ontological version of god: IF the ontological argument version of God exists then 'existence' would be a necessary property of the ontological argument version of God. Even that argument has flaws. "Oh gosh. The shape *does* have the property of triangleness..."
Tell me, what shape are you referring to? Define your terms. The blue region in the image file: BlueTriangle.jpg i.e. the one that looks triangular that you discuss above. The one you introduced with the sentence: "Here's a blue triangle." The one made out of many many tiny blue pixels. @Camestros Felapton: A polygon may have the quality of triangle-ness, just as a shape may have the quality of polygon-ness. But a triangle is a triangle. In this case 3-sides defines the triangle, and so is essence. 3 sides does not define polygon--so for polygons, as opposed to rectangle--being a triangle is an accident, not essence. And for a generic planar shape, you don't even need straight lines for every side, so if you consider a generic shape, then polygon is an accident, let alone triangle. @Brian: Confusion between necessary and contingent qualities is a source of a lot of confusion and persistence in sin for people who wrongly think 'Practicing this particular sin is a fundamental part of my identity'. That should, of course, read "3 sides does not define polygon--so for polygons, as opposed to triangles--being a triangle is an accident, not essence. Is it your personal opinion that the shape to which you refer is not a triangle? A triangle as a universal is a triangle but that's true of all properties if you adopt an non-nominalist position. I don't think you were wandering into nominalism in your earlier point (not that I'd have a problem with that). The problem lies with Brian's example. The specific triangle has a property of being triangular whether you are nominalist or Platonic-realist. It's universal that's necessarily triangular, either by definition or by existing as a form. Of course the same would be true of the universal of "all blue triangles" which for the same reason are necessarily blue and three sided. Put another way: trust your maths instincts. The blue region of BlueTriangle.jpg can be treated as a triangle for most purposes. If it was BlueTriangle.svg then it could be treated as a triangle for even more purposes. Is it literally the universal triangle? Obviously not regardless of what stance we take on the reality or otherwise of geometric entities. Witness the sad spectacle of Camestros tying himself in knots to avoid calling a triangle a triangle simply because I've led him to believe it's what I want. You can tell he's spewing pseudo-philosophical logorrhea as an emotional response to me because he just referred to the same shape as a triangle in conversation with D.J. in the same thread. He's not a serious person. Don't engage him. Gotta be the most fedora tipping moment on this blog. Not only trying to move the goalpost from triangle to shape, but also denying the definition of definitions. A definition is an “if and only if” statement. So the second half of your statement is blatantly false. If it has three sides then it is a triangle. If it is a triangle then it has three sides. Both statements together constitute a definition. You don’t get to deny one statement because you are trying to win Online Arguments in 2019. This may seem highly irregular considering the original topic, but atheist SmockMan wins the thread with his SJW takedown. I was wondering how you would react when you spotted where you'd gone wrong. The character issue is not about somehow being right all the time but how you recover from the times when you are not. Pretending that you aren't smart enough to understand "can be treated as a triangle for most purposes" is a choice I guess. Not a great one though. "It is necessary that *IF* it is a triangle then it has three sides but it is not necessary that it be a triangle." You are confusing a definition with the topic. Now you're lying about me. That's a no-no. 2) You decline to make this just and logically irrefutable profession, and you cease commenting here. Persist in commenting without meeting my terms, and you get spammed. These people are morons. “The shape” refers to a particular shape pictured. A 2D shape with 3 sides. They aren’t sending their brightest. Not that they have much of a brain trust to draw from. Was just listening to a talk by Fr. Ripperger on this. He stated that sin leads to a disordering of the faculties and eventually does make the unrepentant dumber. Considering how satanic/pagan and dissolute our culture has become, it does offer a good explanation of why modern culture has turned into clown world. To be clear, will you be discussing theology from a strictly Catholic perspective? That's my main area of training, but if you want me to take a stab at discussing a topic from another theological tradition, I can take a stab at it. "Otherwise, contingent being would be groundless with no ultimate cause of its existence." Don't you first have to prove that everything must have an ultimate cause? This always sounds to me like "because we believe everything must have an ultimate cause, we believe in the Ultimate Cause." I can't help but feel this explanation is aesthetic in nature. A feeling at the root of thought that things must sit somewhere. There has to be a beginning. Putting aside one's own revulsion to these possibilities -why not? You could say that within a frame of context we can point to ultimate sources, but why does it necessarily follow that that's true about a bounded frame is true for the full infinitude of possibility? How can anything about human experience shed light on this question? Is human logic an instrument that can be used for knowing God? "Don't you first have to prove that everything must have an ultimate cause?" I did. You glossed over it. 1. The impossibility of exhausting an infinite medium. If every contingent being relied on a chain of contingent causes stretching infinitely through time, it would never be now. 2. The problem of motion. As mentioned above, without a Prime Mover, the chain of contingent causality is an infinite train of boxcars with no locomotive. Such a cosmos could have no motion. 3. Empirical observation. The best current science tells us that the universe--that time itself--did in fact have a beginning. 4. Even discounting 3, an eternal yet contingent or circular universe would be even stronger evidence of a Necessary Being because being contingent, it need not exist, therefore it cannot explain its own existence in time, therefore its ultimate cause must be outside of time, i.e. eternal. Whether or not the universe had a beginning in time, we know it's contingent. (If it weren't contingent, it would exist necessarily and would therefore BE God.) Since contingent being cannot, by definition, explain its own existence, either the universe's First Cause is self-explanatory Necessary Being, or the universe's existence is inherently inexplicable. Now, before you go all black turtleneck-wearing 90s coffee house hipster existentialist and assert that the universe has no ultimate explanation, bear in mind that no one really believes that. It's more than just an aesthetic. It's a necessary condition for thought to take place. In short, you can claim that the universe is inherently inexplicable, but you'd have to throw out empirical science to remain consistent. "Is human logic an instrument that can be used for knowing God?" That's the definition of theology. "Every contingent being is so called because its existence relies on some other being. The source of its existence is outside itself." Is this what I glossed over? "1. The impossibility of exhausting an infinite medium. If every contingent being relied on a chain of contingent causes stretching infinitely through time, it would never be now." That sounds interesting. I'd have to think about that, but I can't imagine it. No light bulb goes off. "4. Even discounting 3, an eternal yet contingent or circular universe would be even stronger evidence of a Necessary Being because being contingent, it need not exist, therefore it cannot explain its own existence in time, therefore its ultimate cause must be outside of time, i.e. eternal." I don't understand this. To be clear, even if the First Cause makes no sense to me, that doesn't mean I think God doesn't exist, just not for that reason. I hope you understand Brian, I'm not trying to prove anything here, nor am I an atheist. I've seen Catholics use the First Cause argument (you, Dean Esmay, John Wright, Eve K.) and every time it it just seems like a restatement of the same thing. I assume the fault is mine, but I don't see it. "3. Empirical observation. The best current science tells us that the universe--that time itself--did in fact have a beginning." Does it? Tell if if this is about right, but science says there was a moment when there was no matter and no energy. Because to me an empty universe is still, a universe. Space exists, doesn't it? Why is time synonymous with the universe? Could time be nested in something? Either way, I can't put my faith into this kind of science because... new data might come out tomorrow that changes everything. It's so far beyond what i can understand anyway. "It's more than just an aesthetic." What happened to True, Good, and Beautiful? Don't get me wrong Brian... I don't know if a piece of music I ever loved was "true" but it was certainly beautiful. I don't think a great aesthetic is "just" an aesthetic. Unless you mean "just" as "only" rather than "merely." I'm just saying... I can understand on aesthetic grounds why axiom (Is it wrong to First Cause "axiom") is more pleasing than regression or circularity - but I don't see the logic. "Now, before you go all black turtleneck-wearing 90s coffee house hipster existentialist and assert that the universe has no ultimate explanation, bear in mind that no one really believes that." No, I would have ask questions about what we mean by explanation. Why does one thing feel like an explanation and one thing does not? Besides I look good in a turtle neck. "In short, you can claim that the universe is inherently inexplicable, but you'd have to throw out empirical science to remain consistent." I assume the human race will die out before it discovers ever secret. In the end, it seems that there being a ultimate cause is something you have to take on faith. That's fine with me. You can't function without believing something. I just don't see how it's proven. I reading your responses over and over. Maybe it comes down to the word "contingent." That's a pretty heavy word. I think Mr. Moore below is pointing towards something I can check out, certainly with regards to time. "I assume the fault is mine, but I don't see it." If you're constantly responding to the many and varied arguments presented to you by appealing to subjectivism, stating that you "can't imagine" offered examples, and outright ignoring information so you can retreat back to your default position, it's a good bet that your formation in the subject at hand is deficient. Accepting an argument I don't understand would be bad practice. So would arguing against it. So I'm simply trying to understand it. You put out some intriguing constellations of words but I can't make heads or tails of them. I'm trying to understand your argument and I simply can't. "The impossibility of exhausting an infinite medium. If every contingent being relied on a chain of contingent causes stretching infinitely through time, it would never be now." When I say I can't imagine this, I'm retreating into honesty. Words like contingent and infinite are hard to visualize in my mind's eye. I mean... if I say the fault is mine... and you tell me I have a poor formation on the subject... well... yes... that's what I said. I'm trying to learn something here. Is there another way to use my mind on this kind of problem? Is there an exercise I can use to strengthen my mind so I can tackle this later? "And outright ignoring information so you can retreat back to your default position." It’s not easy or obvious. Part of the answer is getting away from the concept of causes acting over time. While a horse exists in time, what caused it to be a horse is not acting primarily over time. It’s intelligible form is not its mom. One is not tracing its existence as a horse per se over time even though as a contingent temporal being time is inescapable for it. It’s tempting but too simple to think of causes solely as things that came before in time. That’s not what Aristotle or Thomas means by causes, at least not essentially. Thanks for bringing up the vital distinction between primacy in the order of time and primacy in the order of causality. Next to the bait-and-switch they pull with the definition of God, atheists' biggest impediment to understanding the classic proofs for God is their reliance on thinking temporally and linearly. When a pianist plays a concerto, which comes first in order of causality--him playing the instrument, or the music? That question is nonsensical to a linear, temporal thinker. "Part of the answer is getting away from the concept of causes acting over time." This points to something. I don't know where to go with this... I guess I don't understand causation the way Aristotle and Thomas do. Is this like when Spengler says that Nature/Law?Possibility doesn't have time? Yes, the word 'cause' seems to have, understandably, only a temporal meaning in English for most people. It has been suggested that 'because' might be closer to what we mean, which gives us the odd-sounding phrase: "the four becauses." Brian's example of the written music being a cause of what the piano player plays is of a 'formal cause': the player plays what he plays *because* it's what the music says. Final 'because': the player plays because his daughter wants to hear the piece. The end, that for the sake of which all this other stuff is assembled, is the pleasure of the daughter. I hear music, I can ask what it is in many ways, but intelligible answers fall into one or more of the above categories: a piano player plays Fur Elise on his Steinway for the pleasure of his daughter. In this case, only the actual playing itself takes place essentially in linear time, because music as heard is a temporal experience. The other stuff is more or less independent of time in itself, it's only accidentally temporal. The causes are logically separable, but not separable in practice for us: anything we normally experience will have all the causes together. Thanks for this. So I guess Aristotle's Physics goes on the stack. I'm not sure what this means but it points to something. When I write music, if cause and effect are just note-to-note phenomena it doesn't really work. Things group together and the ear doesn't percieve or remember musical information in the order its imparted. Building texture requires a lot of out of order logic, so you're pointing to something interesting. I get this vibe from the old Greeks that each individual object is it's own thing and nothing else, and that seems to clash with the view of forces flowing through objects and blurring some of the boundaries between them. We can't function without cognizing those boundaries, but those forces are real, too - so I'll have to see what the old Greeks really meant. It may just be that some of one takes, and other parts one leaves. It seems Catholic thinkers have crisp definitions but are allergic to the degree one is trapped inside one's own mind. Also, some of the categories they develop... I'm not always sure about them. Read the Metaphysics, reading his Physics is a waste of time. The problem of the one and the many is a perennial problem in philosophy and it's one the Greeks struggled with and failed to solve, indeed the traditional Christian understanding of God is the only one that resolves this tension. 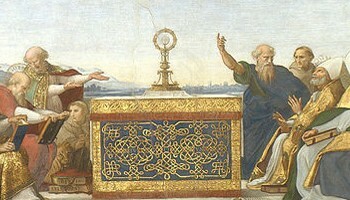 For Plato universals existed in some ethereal world which when taken to its conclusion lead to the idea that the physical world is illusory and must be escaped from. It also doesn't explain how we, material beings, could have any knowledge of this higher reality that we don't exist in and have never been to. Platonists tried to argue that our souls came from that realm and got trapped in bodies somehow but as Aristotle points out this is a dumb, impossible to prove cop out. For Aristotle the universals are entirely contained in particulars, but this doesn't work either as when you experience a particular you're not experience a universal. You're never directly experiencing something's essence through your senses, only ever accidents. This leads to the question of if you can't directly experience a universal how can you have knowledge of it's existence or know anything about it? This isn't to suggest that a particular has no connection to a universal but that if it does you can't know anything about it and it thus becomes impossible to put particulars in categories. Aristotle thus leads to nominalism. To head off the obvious objection that Aristotle says a particular's accidents express it's substance and knowledge of the universal is thus accessible that way, you can't know that itself without first presupposing that the universal exists apart from the particulars. Otherwise whether or not a particular's accidents expresses it's substance would be unknowable. The only answer to this dilemma is from St. Augustine where the universals exist in the mind of God. God is a concrete universal that grants access to all others and orders their relations to each other. We are thus rescued from the undifferentiated sea of being in Plato and the blind maze of particulars in Aristotle. However the gods of Plato and Aristotle are really abstract and impersonal force and abstract impersonal forces don't have minds. This takes you from the un-moved mover of the philosophers to the person of the Eternal Father. I meant it as the foundation for everything else that has no contingency. To append my previous reply, I mean concrete as like bedrock. Further, any philosophy or theology must begin with the fundamental intelligibility of the world. However many pitfalls, traps and illusions there may be ‘out there’ we wouldn’t be talking about anything at all if nothing were intelligible. Radical doubt is nonsense - you’ve abandoned that project as soon as you start talking about it. Thus, Aristotle is first and foremost faced with explaining *how* things are intelligible. *That* they are intelligible is a condition of talking about anything at all. An infinite regress of causes ends up being unintelligible ( not proving it here, just stating the conclusion). This is why in his Physics, Aristotle starts out looking at the physical world and ends up talking about Necessary Being - because that’s what he discovered to be inescapable if anything is intelligible at all. The universe exists, or else there is nothing to talk about. You and I exist, or else there is no-one to have a dialog. Things are intelligible, or else there is no point of having a dialog. Then maybe there's no point in dialog after all. A thinker believing every problem is solvable sounds like an occupational hazard to me. If we're talking First Cause, let's do the nature of knowledge and knowing. I apparently simplify too much. In this case, I mean that there is a correspondence between the world and the sense data about it--there is objective reality. As opposed to the idea that because everyone is in their own minds, they only know their subjective perceptions. @Jared Burrell: No one claimed that every problem is solvable. Engage with your interlocutors' arguments, not arguments they remind you of. We're talking ontology. Epistemology is off-topic. That's fair. To be clear I don't have a quarrel with there being an objective world, however unknowable much of it might be. Thank you for this. These posts are always enjoyable to read and think about. Mr. Wright used to do more of these and I do wish he would get back to them. However, I question just how many people cannot understand such things versus how many simply do not want to. Those who want an out will do whatever they can, even if it involves word games and willful ignorance. This is why I long ago stopped discourse with fedoras. It's just a waste of my time. @JD Cowan: There's also a large subset of fedora/neckbeard/clever types who want to be right all the time so much that it's a need, an addiction. And they fear being wrong more than anything in the world. The problem is that they are not humble, and so do not accept correction, reality, or even honest discussion to define terms (instead, they'll define the terms so that only their conclusion is possible). Thanks for posting about this, Brian. I have to admit until today I would have lumped so many things in under theology. Problem is that you can't exorcise people against their will. And you can't tell me that the SJWs don't love their demons. Thanks for this post.it's a very helpful primer of the 5 proofs.it'll a good starting point should I read Edward Feser'sbook on the subject. TL;DR God is the First cause and prime mover who created an intelligible universe. Human reason can discover him but belief in him is rhw leap of faith. A yes to him. I would like your honest opinion on James George Frazer's book "The Golden Bough". I stumbled across this book several years ago and I found it interesting, to say the least. I already know how poor the book is thought of in historic circles. Frazer himself tried to resign his teaching position after people pointed out the flaws in his argument. Still, I think he was correct in his observations about killing Gods, that you have to replace them with a better God. That, I think, is what atheists tried to do with science, but failed because science is not God. Thus, the huge amounts of theological literacy on the internet today. It's on my to-be-read stack, but I haven't gotten to it yet. I think the important thing to note is that while this may not be held to convince the reader of God, it DOES demonstrate that God is a rational and even necessary part of a rational, causal universe (or our mental model of it if you prefer). The argument that God is either an unnecessary or irrational idea is dead; indeed, nonsensical. Cameltoe Fapatron, above, is guilty of not understanding semiotics. The picture of a triangle can be said to not be a triangle, in the same way that the word triangle is not a triangle; but the triangle is signified. The triangle being a representative and using pixels no more disproves that triangles are triangles, than the word "elephant" not being an elephant disproves the existence of elephants. In fact unless I am mistaken the Cameltoe argument would support Aristotelian notions of "intelligible form", that being a very reasonable synonym of "the signified" in this case; and even then, by referring Plato he gives his entire argument away anyway. Exactly. The explicit point of the post was to define what theologians mean by God, not to demonstrate God's existence. Love posts like this. Agree with JD, my favorite posts at Wright’s blog we’re posts like this. I miss talking philosophy and theology at the seminary with the few professors who weren’t progressive mush brains. So thank you for this. Only way to make posts like this better is to light up a cigar and have a tumbler of whiskey. Did you per chance pray to God to help you work on the virtues of meekness and patience? Because posts like this are going to be used by Him for just such an exercise. You're welcome. I will act on your prayer suggestions.